My father was an early member of the Fire Bell Club. I joined in 1971 and have two brothers who are also members. John as a BKLYN guy do you remember the "77 Club" ? .... I was not a Member but had been invited there a few times by some BKLYN Dispatchers that were Members....I seem to remember the Clubs Quarters being on a floor in a Loft type bldg on Bridge St in BKLYN near where United Insignia had been (before they moved to QNS). Didn't they respond to multiples with a canteen-like truck and give out drinks? Chief, I have heard of the 77 club but never knew any members or where they were. I believe there was also a 255 club in the old days. I never understood the operational differences between the Salvage companies and the Fire Patrol. Can anyone explain? I seem to remember a 77 club and thought that it was on Union St on the same block with E269 back in the day (early 50's. I'm not sure what year it closed down,I'll ask ret Disp 120 we were just there in June. 77 Club was always a social buff organization, never operated a Canteen, but did maintain a respectable Fire Museum at their quarters. 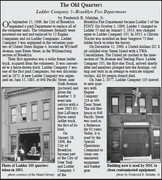 They may have originated near Engine 269, but were then on Bridge Street Brooklyn, and finally 326 Livingston Street until they were dissolved c 1980. WNYF 1st/1949 has an extensive article on the Club with photos. 255 Club did operate the Red Cross Canteen for multiple alarms, and also a Red Cross affiliated victim relocation service. 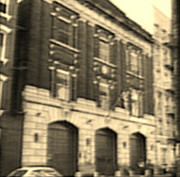 In final years (c1980s) they were quartered at Red Cross HQ near High Street, Brooklyn. One of the artifacts maintained at their quarters was the locomotive bell and Maltese Plate from Doc Archer's 1949 Flxible Ambulance 1.
fire buff club on Staten Island. 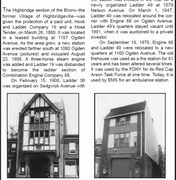 Regarding reply # 409, after Salvage 3 on Webster Ave (former E48 Qtrs) was closed down in 1991, there were TWO (?) Second Alarms in that vacant building. The first one I was buffing the area. It was sad as FDNYs history was going up in smoke. Also as I understand it, The Fire Bell Club publishes a monthly report on the multiple alarm fires each month, similar to what "signal 73" does for us on this site in the "City Wide section". Although there may be variations in the numbers depending on what is posted here. Mack, Staten Island's 88 Club also ran the canteen service and also published a pretty thorough newsletter (as did the TAA - Third Alarm Assn of Manhattan). In later years 88 members preserved some older apparatus.